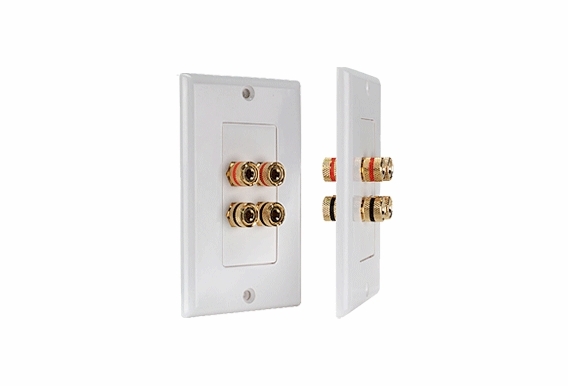 The WP4 Terminal Decora speaker binding wall plate offers a clean, wall-mounted wire connection for one pair of speakers to your stereo system. 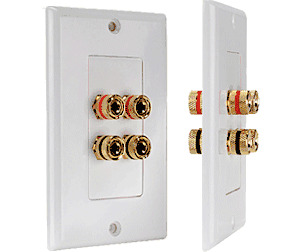 All connectors are gold-plated for maximum conductivity and durability on this audio speaker terminal wall plate with installer-friendly inserts from Outdoor Speaker Depot. The Decora-style design "makes installations look professional," writes one customer. "Just what I needed and half the price of what they wanted in town," writes another fan. Also read our customer reviews on this page to learn more about the versatility of this good-looking unit. These state-of-the-art speaker wall plates create a custom finish with cables tucked neatly behind the wall. 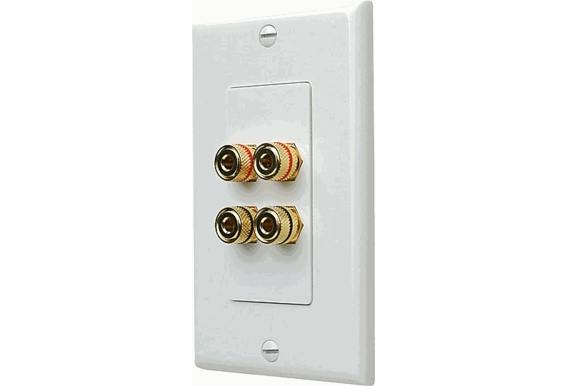 With this white wall plate with an in-wall speaker to amplifier connections, use up to 12-gauge bare wires or 8- to 16-gauge banana plugs. Opt for the banana plugs if you want to quickly connect and disconnect connections. On this color-coded WP4 unit, red terminals are the positive terminals, and black are negative. Enjoy free lifetime product technical support with every purchase from Outdoor Speaker Depot. Our tech support pros are available by phone or email to assist with any compatibility or installation questions. Put the finishing touch on home theatre and audio/video installations with these high quality architectural audio wall plates. Unique two piece design utilizes elegant installer friendly inserts and wall plates. All connectors are gold plated for maximum conductivity and long life. Decora Style Instead of each unit take one single gang, you have the flexibility to install multiple units in one big plates. Do you have to use Banna plugs with this plate? Or can you insert the wire into the post and screw the post tight to hold the wire in place? do you have in black? Is there a cover for this wall place to allow for outside weather? Would an AC outlet cover be adaptable? Hi Dave, It doesn't come with any weather-resistant plate/cover, but you can use with a single-gang cover for outdoors. 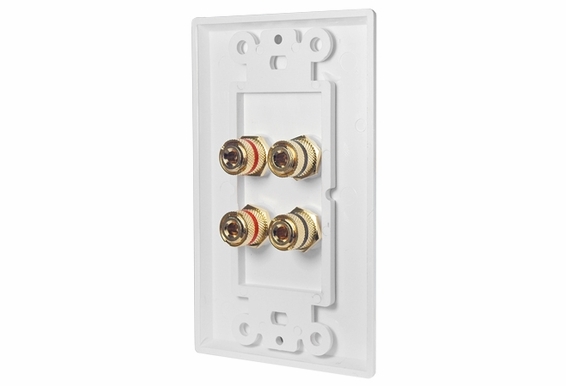 Can WP4 Terminal Speaker Binding Wall Plate be used with a standard electrical outlet box? It looks like they mount just like a duplex outlet and get a cover plate over to finish. Is this correct? Hi Rich, It should work with most single gang low voltage mounting brackets although there may be one or two brands that have an odd-sized bracket. How is the back side (in-wall) connected to bare ware? Is it a compression connection, solder connection, or some other method? Thank you. 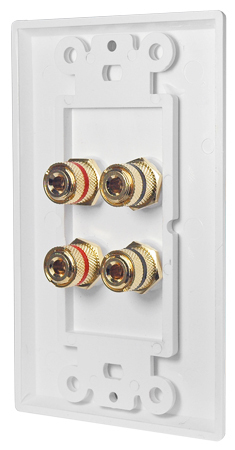 Is it possible to separate the 4-terminal decora insert from its wall plate so it can be used with a 2-gang wall plate instead? I have an IPod, how would I connect it to this speakers? Why are the top terminals in red color and bottom in black? The red terminals are the positive terminals & the black are the negative terminals.